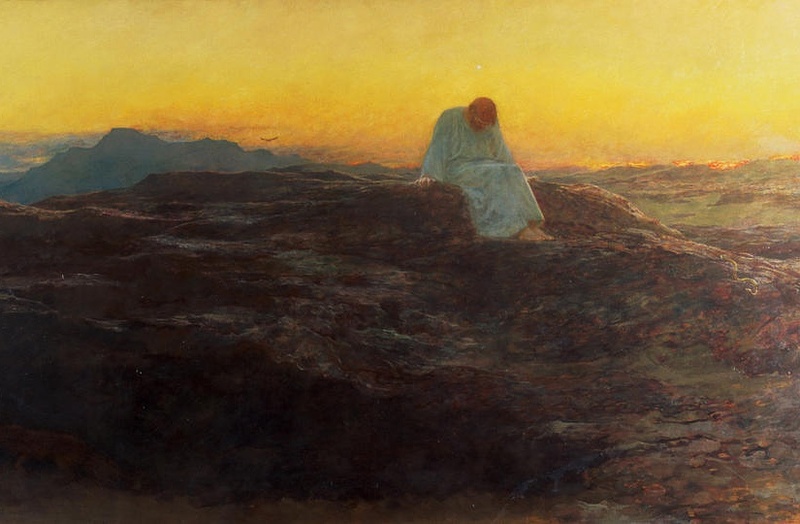 Today we begin Lenten fasting, each of us entering our own desert to free ourselves from the temptations that lead us astray. Our models are the prophets and Christ himself. Let us begin this season with renewed zeal and commitment to the Lord. The son of an artistic father, Briton Riviere gave early promise of distinction in the realm of art. At the age of eighteen he exhibited at the Royal Academy, and his pictures became an annual feature at Burlington House after his twenty-sixth year. “The Temptation In the Wilderness” is an example of the artist’s technical skill and knowledge, and is also interesting as being the successful outcome of an experiment in colour. The painter decided to express the sentiment of his subject almost entirely by means of colour, i.e. 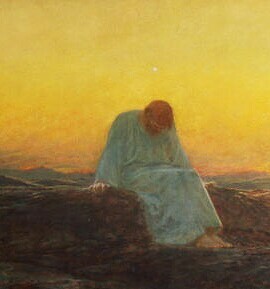 by the white figure of the Christ against the sunset glow of the sky, both sky and figure being focused by the gloom of the landscape. He made many notes of the colour effects derived from the juxtaposition of white and sunset, and found, as he expected and hoped, that the white, in shadow with the cold light of the southeastern sky, appeared almost as a bright blue against the warm northwestern sunset sky. This enabled him to dispense with the conventional nimbus of purely ecclesiastical pictures, and yet achieve an effect of the miraculous by showing, as if by accident, the white evening star, greatly magnified by the composition, just over the head of the Saviour. From the book “Famous Paintings” Volume 2 printed in 1913. This entry was posted in Art, Lent and tagged Ash Wednesday, Christ, Into the wilderness, Lent, Lenten fasting. I also see a wide-wing span bird just on the horizon above the distant mountains… by the shape of the wings, I would conjecture that it is a vulture. Hmmmm. Symbol of the tempations of Satan to come? Regarding Lent, I often find my friends’ selection of what is of importance to give up for the season rather trivial (of course, that is my judgment). One year, I suggested giving up God, as the entity of ultimate importance… Another year, I suggested giving up sarcasm, which of course was a violation of the plan from the start. I guess everyone has to decide what their own temptation is. Perhaps it may seem trivial to others, but if removing it helps them grow closer to God, then it’s an effective fast, right?